Did you know that the fabulous Gallery of Modern Art has its own specialised Children’s Art Centre, in addition to the children’s exhibitions displayed in the gallery? The Children’s Art Centre runs a bunch of regular activities and exhibitions curated with children’s interests and development in mind. Kids’ APT7 is a series of 13 exhibitions from artists across the Asia Pacific region. Previous artists include Tony Albert from Australia and Eko Nugroho from Indonesia. These works are displayed at the Gallery of Modern Art and the Queensland Art Gallery and are available to view during the galleries opening hours. Toddler Tuesday is a program that, predictably, is available for toddlers every Tuesday. The program focuses on one collection in the gallery and incorporates games, dancing and creative play to help toddlers (and their parents) learn about art in a fun way. Toddler Tuesday is suitable for children aged 18 months to four years old. While they are free to attend, bookings are essential. Can’t make into the city? Learn about art at home with a range of games on the GOMA website. 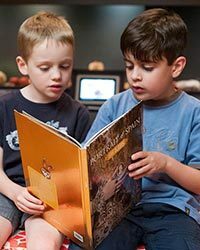 Each game provides child-appropriate learning activities based around past and present exhibitions in the gallery. 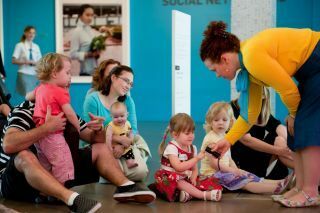 It’s never too early to start your child’s cultural education, and the range of free activities available at the Gallery of Modern Art makes it a lot easier for parents.